The responsibility of being a big-money signing for Real Madrid is not just about having the ability to produce moments of individual brilliance, but actually delivering it when it matters most. And, strange though it may sound, when it's your turn. In the closing moments of the Copa del Rey final against Barcelona with the match finely balanced at 1-1, Gareth Bale showed perfect timing with an extraordinary solo goal that started in his own half and almost took him into his opponents' dugout before he emerged ahead of the helpless defender Marc Bartra with just goalkeeper Pinto to beat. At that moment, everybody at the Mestalla Stadium collectively held their breath, sensing that something truly remarkable was unfolding. It was a pause that in turn made the resulting roar of the Madrid faithful that little bit more high-pitched than it might normally be for your average late winner in an El Clasico as Bale finished off his great run by slotting the ball home to win the Cup for his side. "I had the perfect view," said Real manager Carlo Ancelotti. "It was a fantastic goal from an extraordinary player. We're lucky he plays for Real Madrid. It's certainly the most important goal of his career. It came at a decisive point of the match." Ancelotti's assistant Paul Clement was even more gushing with his praise, remarking: "It was an incredible goal. I'm not sure I've ever seen a goal quite like that. "He was two or three metres off the field, in front of the Barca dugout, and from there you never think he's going to be putting the ball in the back of the net. It was an amazing goal in such a big game as well." The significance of the occasion was echoed by club legend Emilio Butragueno, who told Spanish television channel TVE: "He travelled more than 50 metres with incredible power. Bale gave us an idea of the category of player that he is. Players at this level have to appear in these games and he has done." But this was not just any big game - with Cristiano Ronaldo out through injury, it was 24-year-old Bale's moment of truth since joining Real from Tottenham Hotspur on a six-year contract for a world record fee of £85.3m last September. He was Real's 11th big-name signing - all have been labelled 'Galacticos' - under club president Florentino Perez since 2000. As the Madrid-based newspaper Marca put it on Tuesday morning, apparently quoting a senior source from within the corridors of power at the Santiago Bernabeu: "Without Cristiano Ronaldo, Bale has to come up with the goods." The paper added: "Having forked out 91m euros to bring him in, Los Blancos have a right to expect him to be a game-changer on the big occasion." So there was clearly pressure on Bale in the build-up, regardless of whether he chose to acknowledge it or not. According to Marca, there is some mystery in the Real dressing room over how the Welshman mentally prepares himself for such matches, with his colleagues suggesting he goes into his shell and can be rather aloof during the week. The next day, Bale - who has now scored 20 goals in 39 appearances for Real Madrid - proved his point in the 2-1 victory and won over his doubters with the Spanish media lauding his match-winning performance. Marca had the headline "Real Claim Copa on Bale's Brilliance", while As.com wrote: "Bale is the King of the Cup", before adding: "The Welshman decided the final after a gallop of 60 metres that nobody could stop." The Wales international himself had appeared to brush off the notion that this game was somehow different to those when Ronaldo is the go-to Galactico, by insisting: "I'm never too worried about what people say. It's just important that I concentrate on my game - I don't put myself under any pressure." Naturally, the next question he fielded was about Ronaldo's reaction to a goal that the Portuguese would undoubtedly be proud to call his own. Bale replied: "He just said 'congratulations'. He's very happy obviously. He's played in every single round and it's just unfortunate that he had to miss the final." Bale knows the game, both inside and outside the dressing room. That means speak when you're spoken to and make sure you're ready to deliver when it's truly time to deliver. When the suggestion followed that he might now keep Ronaldo out of the team, Bale chuckled at the mischief of it and remarked: "Yeah, nice try." 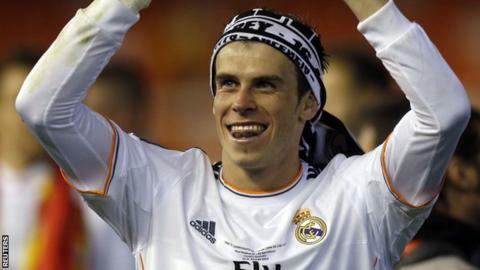 Gareth Bale is Real's 11th big-name signing under president Florentino Perez in the past 14 years. Soon enough, probably next week against Bayern Munich, Bale returns to playing second fiddle, on the right-hand side of Ancelotti's front three, while Ronaldo slots back into his preferred role on the side of the pitch from where Bale produced his moment of quality. That is not to say season-defining contributions of this calibre are not welcome at any time, but Bale has to accept that when both superstars are present and correct, Ronaldo's runs are the ones that passes revolve around. And it is Ronaldo who primarily takes the flak when results are not right. Bale has had a taste of that now. He knows precisely what it feels like to be in Ronaldo's shoes, with all the weight of expectation, and he has found that his feet slipped into them rather comfortably. Privately, he is probably itching for more of the same. Next year, Ronaldo turns 30. And while we should not expect that to be the cue for a significant decrease in his relentless high standards, injuries of the sort that kept him out of the Copa del Rey final might just gradually creep into his career with greater regularity. For Real Madrid, there will be satisfaction in knowing with greater certainty that Bale can be ready to step up at a moment's notice.